Famgrab Day! The Deal of the Day! Today is a great day. 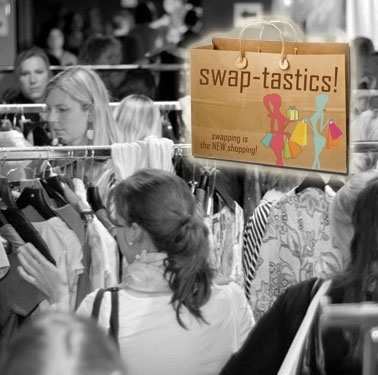 Today the wonderful site http://www.famgrab.com/ has displayed out Summer Fashion Swap as the deal of the day! It's a really great deal too! The Fashion Swaps are normally $20 but today you get it at 60% off! A whopping $8!! We are so excited about being featured today! Today is a great day! See you at the SWAP SHOP! July 23rd! I cried as my children rode away today! Have you ever sent your kids away to another state? It was about 5:50 am as my son came to the side of my bed and said, "Mommy, can I tell you a secret!" He leaned over and said, "You are the best mommy ever!" And just stood and looked at me. I looked at him and started crying! He ran out the room, down the stairs, and into his grandparents mini-van. They were taking him and his sister to Florida. My daughter on the other hand wasn't as excited to go. As I walked downstairs, I heared screaming. Her daddy, is holding her as she screams, "I wanna stay! I wanna stay with Mommy and Daddy!" I want to bust out crying even more. I want to grab her and run back in the house! I really do. Instead, I stand there. I let daddy handle this one. And he does a nice job of it. He gives her, who by the way is 3, his fathers cell phone and calls his own cell. He talks to her from his cell as they pull off to make her feel better. She calms down. It worked. My husband walks in the house still talking, as I wave by outside and crying like a baby. I started praying for my babies. You might be saying, "Why is she over reacting?" And maybe I am, but we live in Georgia. My in-laws live in Florida and it's not a hop-skip-&-a-jump away! It's hours. I have no problem or doubt they will take great care of their grand babies, but for me it's about the distance. They have watched them once before and I cried like a baby then too! 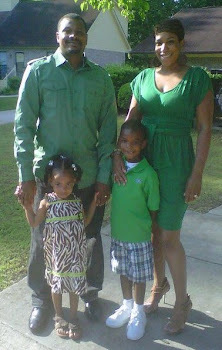 I am going to miss them for sure even though I look forward to some alone time with the hubby. I am just not used to sending my kids away "for the summer!" Well it's really not for the summer, more like a week. Still, I honestly don't see how people send their kids away for a whole summer! I would be on edge all summer worried about my babies. I just need some peace that's all. Some peace. Have you ever sent your kids away for an extended period of time to another state? The following read today was found on http://www.youforie.com/. I thought it was an interesting read because I often speak to African American women who want to look good, but not good enough to sweat and workout. It's like the hair is the ruler of all things. I understand wanting to look good, but you can get your hair done ANYTIME, but your body is your temple and it's not an overnight project. I say you should workout and get your body in the condition you really desire and then worry about your hair. Why be fly from the neck up and your body isn't 1) Healthy & 2) In the best condition because you can't sweat due to your hair. The sad part is I used to think this way in my 20's (when I had a relaxer, and that was my excuse.). But I still worked out (a lot of walking in 30 minute increments) because I knew what I wanted my body to look like. Now in my 30's, I do not have a relaxer anymore and unfortunately after two kids my body goals are even MORE IMPORTANT so not wanting to sweat is not an option! In my 30's, walking wasn't enough. I have had to add workout routines, to get, stay and keep it toned! I can sacrifice a few cute hair days here and there to know that when I step out [for events or whatever] I feel I look great because I put in the work to do so. A 2007 study by womenshealth.gov showed that 4 out of 5 Black women are overweight or obese. In 2009, the CDC found that Black women were 60% more likely to be obese than non-Hispanic White women. We are all familiar with at least some of the diseases and health problems that are caused by obesity which include (but not limited to): Type 2 diabetes, high blood pressure, increased LDL (bad) cholesterol levels, heart disease, stroke, and death. With many Black women spending $70 or more for a relaxer and over $150 for a weave, one trip to the gym or pool can ruin the style causing more money to be spent bringing it back to its original glory. As a personal trainer with seven years in the industry, I have personally heard this excuse over and over again. I have even been asked not to make workouts as intense to save a hairstyle. I know women who would rather pop a pill, drink a weight loss tea, have surgery (from lipo to lap band) and/or starve in order to lose weight without working out. Others feel that the only other option is to not do anything about losing weight at all. Obesity is an epidemic in the Black community and we must wake up, see the importance of exercise, and drop the hair excuse to put an end to it. Luckily, there are ways to become active without ruining your hairstyle. In the 1990’s researchers at Harvard University created a pamphlet for active Black women called "Hair Care Tips for Sisters on the Move," that offered advice for maintaining both a healthy lifestyle and hairstyle. This pamphlet can still be found online at www.hsph.harvard.edu/sisterstogether/move.html. Braids: This is a style I recommend to clients often. Micros, Cornrows or French Braids can be an easy way to maintain a cute style. You can also opt to create a couple of braids during workout, then take them down for a wavy, tousled look afterwards. Weaves: Sew ins work well to protect your natural hair (because it’s braided) with the weave sewn in. This way you can wash the hair more often (if necessary) and be able to style it without damaging your natural hair. Natural Styles: This is the route most Black women are taking now. Instead of fighting the natural hair texture, embrace it. Locs, Twists, Short afro or just wearing the hair out creates freedom to be as active in many ways including swimming, which is so often avoided by Black women due to hair concerns. I have personally been loc’d for 6 years now & love it! I was active before with a relaxer, but having locs makes it so much easier. As you can see, there are many hairstyle options available to look good while becoming more active and creating a healthier, fitter, better you! 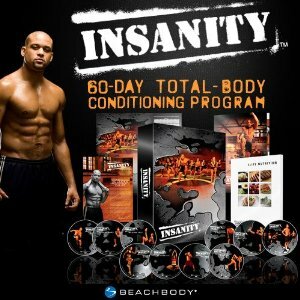 I completed my first week of this Insanity workout. I completed 6 days in a row! And what a workout it is. I have been getting up at 6am every morning to go in my basement and workout before the rest of the house gets up. It’s funny because my children get up after I finish and they always ask me, “Mommy, were you working out?” They know that mommy and daddy do work out. They even join in and hang as long as they can. Insanity is INSANE. You work every part of your body without weights! And you start sweating during the warm up! I like that he yells in the camera, “You can do it!” I need that sometimes. I like when he also says, “Take a break when you need it!” and “Never compromise form for speed!” If you do this program, you will need a break unless you are superman. Just get back up and get back in it. When I do this work out, I just concentrate on the finished product. I see myself TONED! So, one week down. 7 weeks to go. August 26th BABY!!!!!!!!! I will say my husband is doing this as well. We are just on different schedules. He works out at night and is one week ahead of me. I told him that we can be each others arm candy.